Saturna Seaside is a retreat for those who love the outdoors. However, it also features some amenities that will allow you some fun indoors as well. 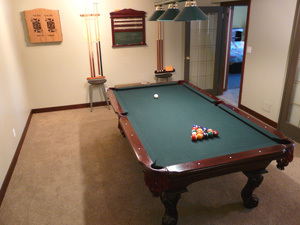 The billiards room is located on the first floor of the house near the King bedroom suite and the entertainment room. Pool is a great game for the whole family, experts and novices alike! There is also a ping pong table that fits over the pool table. It's another fun game for all levels. The music lover will enjoy our piano during their stay at Saturna Seaside. The piano is located in the entertainment room next to the billiards room and near the King bedroom suite on the first floor of the house. 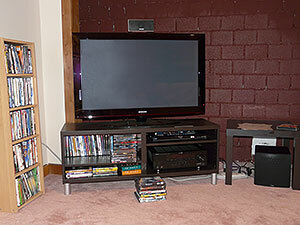 The TV/DVD home entertainment system (some TV reception) features a flat screen TV, Blu-Ray player and a DVD library with over 175 titles with something for everyone. 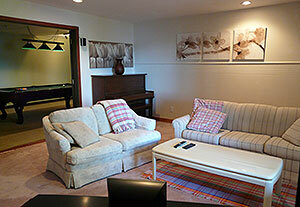 The queen sleeper sofa is located in the entertainment room. The entertainment room, which has fantastic ocean views, is on the first floor of the house and can be closed for privacy.